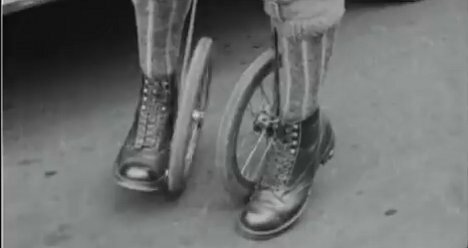 When the giant-wheels-on-boots skates were introduced, we assumed that they were a modern invention. But it turns out that they date back at least as far as 1923 when this short film was made. In it, dapper men race around in their silly-looking “cycle-skates.” But to their credit, they all look like they have a degree of mastery over the sport. Lacking any of our modern safety equipment, these brave chaps demonstrate how to use the skates in skiing or skating fashion. It just goes to show that humans figured out ways to have fun even before there was technology to brag about that fun to the world later (we’re looking at you, Facebook, YouTube and Twitter addicts).